Sales of desktop personal computers have been in sharp decline over the last few years. Mobile device sales have skyrocketed. Growth of 4g mobile networks and development of mobile apps for almost all online resources have supported the world going mobile. By 2017 87% of connected devices are expected to be smartphones or tablets. Internet Access: With mobile devices comes access to the internet and all of the information that comes with it. 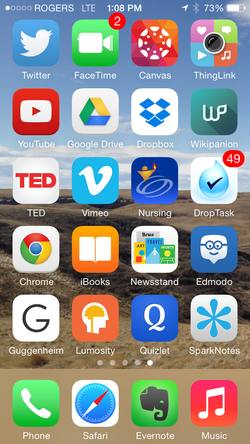 Applications/Tools: There are scores of apps designed for mobile platforms. These are often designed with specific educational settings in mind, and can give students tools to enhance the learning experience. Connectivity: Mobile devices connect students. Not only to each other, but to experts in their field of study located throughout the world. Interaction Between Peers: These devices can connect classmates allowing for the educational experience to exist beyond the confines of the classroom walls and schedule. Growing Mobile Access: The number of students owning mobile devices is grown significantly in the last decade. Students with these devices are often bringing them into the classroom for both educational and non-educational purposes. Growing Mobile Usage: Not only are students access to mobile devices growing, but the time spent on these devices is growing, even surpassing use of television and other media. Students Have the Devices and Want to Utilize Them: Smartphone use has rising dramatically and their owners are using them in their everyday lives. A 2013 Canadian survey had 8 in 10 smartphone owners claiming would not leave home without their devices. With public institutions constantly under the knife for potential funding cuts implementing BYOD strategies. Having the students bring their own devices to the learning environment takes the pressure off of the institution/instructor to provide all of the technology to enhance the learning experience. Privacy: It is hard to discuss mobile devices in a classroom setting without having a discussion about privacy. Cyberbullying: With mobile device and social media use the reality of cyberbullying may concern those looking to implement BYOD in the classroom setting. Distractions: The arrival of mobile devices in the classroom have brought with them a concern that they will be a source of distraction for students. 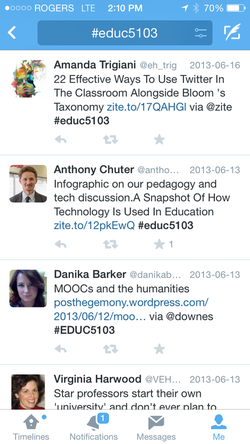 Mobile devices allow for more collaborative opportunities to exist for students. Through mobile devices and the apps that exist for them extends the learning experience beyond the physical walls and schedule limitations of the classroom. Mobile devices allow for students to collaborate without being in the same physical location. 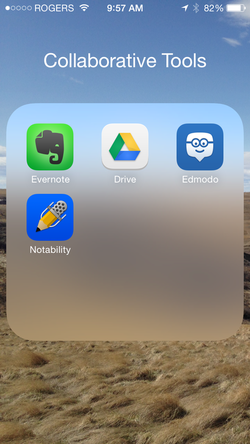 Tools like Evernote, Google Drive, and Notability allow for collaborative note-taking. Mobile devices can be used to access the Learning Management System allowing for the classroom to extended beyond the physical learning institution. With mobile internet access coming into the classroom students are arriving with the world's knowledge at their fingertips instructors can use this as a learning opportunity. With all content available instructors can focus more on application and critical thinking in the classroom and leave the lecture/content delivery to be utilized through mobile devices. Not only do mobile devices connect students with each other they also connect students to the outside world. Tech Review with Mark & Kyle - Episode#2 from Lethbridge College on Vimeo. Evernote in the Classroom from Lethbridge College on Vimeo. Oliveira, M. (2013, July 29). Google study: Smartphone ownership way up, Canadians addicted to their phones. http://www.ctvnews.ca/sci-tech/google-study-smartphone-ownership-way-up-canadians-addicted-to-their-phones-1.1388185#ixzz30xZSTXXY.